This is the first post in an on-going feature on products you need in your beauty arsenal leading up to summertime with a splurge vs save option for each recommendation. Is a sunscreen on your list this summer? So let’s get to the first category, sunscreen. The formulas are getting better when it comes to ones that go on clear or at least quickly fade to clear. $ - COPPERTONE Clearly Sheer Faces Sunscreen Lotion SPF 50 ($7.99/2oz @ target.com) - water-resistant for 80 minutes. Absorbs quickly. $$$ - KIEHL’S Super Fluid UV Defense SPF 50+ ($38/1.7oz, $61/4.2oz @ kiehls.com) - mineral-based. Great for those with sensitive skin. A good quality sunscreen doesn’t have to break the bank especially since you should reapply an ample amount throughout the day. 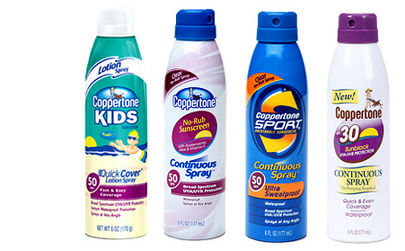 COPPERTONE’s latest collection of sunscreeens has one for every situation. Need to cover Johnny with a high SPF before he goes outside to play? Kids QuickCover Lotion Spray Sunscreen, SPF 50. Need one that’s Oil-Free? Oil-Free QuickCover Lotion Spray Sunscreen. Playing on the local softball team this summer? Continuous Sport Sunscreen Spray, SPF 50. And for those like me who are just plain lazy when it comes to exerting any effort to rub it in, Continuous No-Rub Sunscreen Spray, SPF 50. $6.99-$9.996oz @ walgreens.com amazon.com.